When I first started doing infusions, a banana liqueur wasn’t really at the top of my list. It simply didn’t appeal to me. But the longer I do this, I hear more and more people talking about banana liqueurs they have had and how tasty they are. At some point, I would like to do a banana rum. But since I have more experience infusing bourbon, and I really think of bourbon as a fool-proof spirit base for infusions (ok, I’m sure someone will tell me otherwise). So, with a small leap of faith, we embarked on banana bourbon. This is really easy and delicious. They may not look pretty, but they were perfect. We took these two perfectly ripe bananas, added two cups of bourbon, and infused for just over two weeks. I guess two was the magic number because this is another keeper. It tastes like sweet bananas and a mellow bourbon. I think this will make for some great cocktails, but it is also great on its own. Be sure to filter, then strain through cheesecloth and coffee filters. Categories: Infusion, Liqueur, Recipes | Tags: banana, Bourbon, infusion, Liqueur, recipe | Permalink. Fascinating! Does the bourbon pick up much sweetness from the bananas, or is it mostly just banana flavored? Love love this infusion..very tropically! Bingo! I have a rather large quantity of Buffalo Trace left in my liquor cabinet that is taking up way too much room (it’s a 1.5L bottle that I was given for Christmas a couple years ago). I’ve already tried making a Bourbon Cream Liqueur which was kind of so so . Banana Bourbon sounds like my next experiment! Thanks for the great idea. Awesome! I hope you like it. I thought it was quite good. If you’re looking for any other bourbon infusions (they all really do so well), some of my favorites were the coffee bourbon and the cherry bourbon. cheers! Thanks Alicia! I’ll let you know how it all goes. I did the cherry bourbon and made it into a cherry coke. The cherry and I did a honey bourbon were my very first experiments and I’m so excited to keep infusing. I have a banana bourbon working right now! Wow, you left buffalo trace sitting in your cabinet for a couple years!…that would have been gone in a week if it had been in my possession. Never could understand someone just letting something so good just sit on a shelf. I just said basically the same thing to my husband after I read the review from the lady saying the Buff was taking up space! So funny. Hubby said it would last a week here. I’m thinking manhattans, old fashions, on the rocks with seltzer. . .
Yum! I hadn’t thought of it, but I guess it does sort of taste that way, although I’d say bananas foster would be much more rich. I saved the bananas and put them in the freezer to add to pancakes or banana bread or something. but rum sounds realllly good with bananas! Well, if there is one thing I have learned from infusing is that the flavors can surprise you. My four basics that I use for most of my infusions are vodka, gin, brandy, and bourbon. Before I started infusing, I would have told you that bourbon was my least favorite of those four. And now, I would say it has gone up significantly, and for infusions it is probably my favorite. It is really easy to infuse with, but so is brandy. They both have so much natural sweetness that you often don’t need to add any sugar. This sounds amazing. What bourbon did you use? I assume not top-of-the-line, but also not the bottom. Thanks, and you are correct on the bourbon. I think Jim Beam works great for infusions. 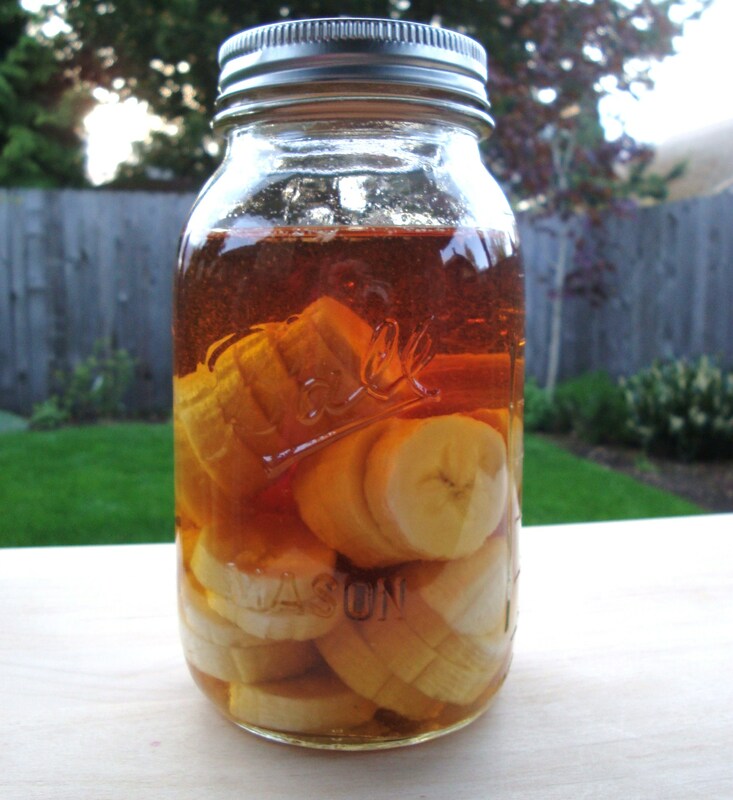 After some soul searching I decided to buy a pint of Wild Turkey 101 to try infusing with bananas. I think the the salty dark sweet & aggressive oak and touch of spice will hold up well to banana sweetness. I was tempted to go with sweet and soft Evan Williams Black but felt that might err on the side of sweet and flabby. I’ll let you know how it turns out! Perfect! I made my first banana bourbon cocktail this evening. It was good but not too noteworthy. (chocolate bourbon, banana bourbon, marshmallow brandy) I will keep trying. Don’t let this stop you. The banana infusion is great on its own. I see The Coop has made his way here! Excellent! As far as the Banana Bourbon goes, I have so far only had it on its own over ice. Quite nice! As I said on Instagram and Twitter over the past two weeks, this was a really nice way to finish off that jug of Buffalo Trace that was taking up way too much space in my liquor cabinet. Happy to see that people are really into this. All good fun! Thanks G-LO, I also think the banana bourbon is good on its own. I will try another cocktail or two, but I’ve been busy with raspberry and strawberry infusions lately – sorry! For another summer inspiration, peach bourbon is very nice. I made a white peach bourbon last summer and it was delicious. This is my first attempt with infusion….making not drinking!! I am making this for a christmas gift and would love some sort of recipe to put on the bottle, either drink or eats. Also is that marshmallow brandy something you made? Thanks. Look forward to trying many more of your recipes. Hi Debby, I’m very excited for you to be experimenting with your first infusion. I’m sorry I have not posted any banana bourbon cocktails yet! I will have to do that soon… Until then, here are a few from a blog Measure & Stir. They have a lot of great cocktail ideas! Yes, I did make a marshmallow brandy. I have not yet posted it yet. There are lots of marshmallow vodka ideas online, but I made mine with vegan marshmallows, so they didn’t quite dissolve like I think the regular ones might. You can try just throwing some marshmallows in brandy and let them sit for a few weeks and see if they dissolve. I just read a new posting from another blog I follow here on WordPress: MEASURE & STIR. He just wrote “Banana Split: Chocolate, Banana, Lemon” using banana-infused whiskey. Just thought you’d want to know (if you don’t already). What a great idea! Love your site here! Thanks Shelly! So glad you have found us! Hi. I have done some infusions before—lemons, blueberries, cranberries, to name a few. But I need a source for some nice, but simple bottles to put it in. I like the one here on the banana bourbon—where do you get those? What about using tequila to infuse? What would be good to put in it? Where do you get your amazing bottles with the plastic capped corks? The plastic-capped corks are sold separately and fit on wine bottles, etc. Hopefully one of these will have what you’re looking for, and hope you find a good store near you! Jennifer, thanks for finding us! I hope your husband and your friends enjoy! This one was really easy, a good one to start with. I have had peach flavored tequila before. Hmmm, maybe I could infuse the tequila with a couple of peaches. I don’t really care for tequila very much, but I loved the peach tequila. It was so smooth! Hi Roxy, I think infusing a liquor really does allow it to take on a very different flavor. So if you have tequila and you aren’t drinking it, I definitely think you should infuse it. 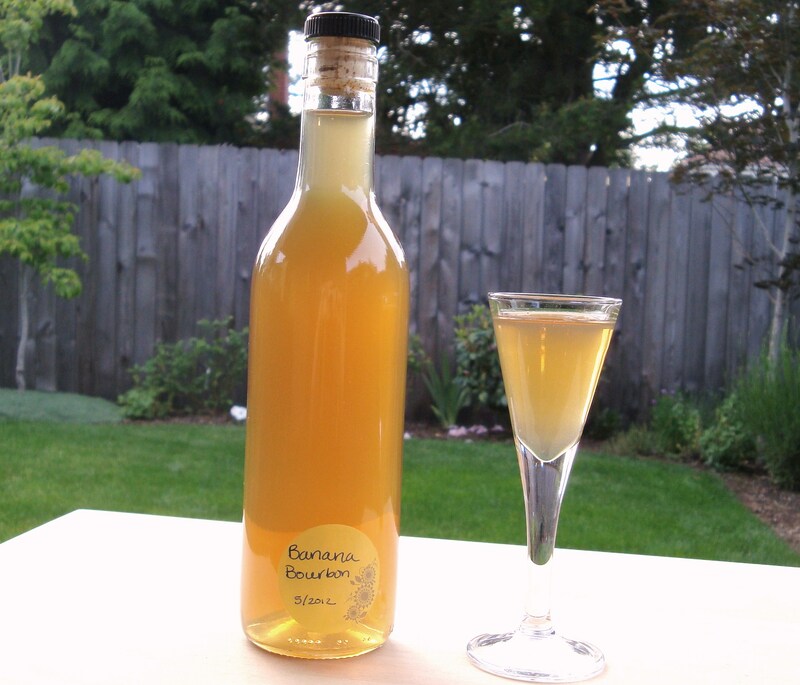 I have made a peach bourbon and peach brandy, and they both turned out great. peach tequila sounds fun! Thanks Alicia! I didn’t realize flavoring liquors could be so easy. We had an over ripe banana, a new ball pint jar, and a bottle of Jim Beam so we’re giving this one a try. We’re halving the recipe since we only have a pint jar and 1 banana. We’ll see how it goes. Perfect, let me know what you think! Hi Jim, the peach bourbon is an easy one… Take about 2-3 very ripe, juicy peaches, and 750 ml of bourbon. Pour all together in a large 1/2 gallon jar. Infuse for 4-5 weeks. Strain and enjoy. If the peaches are large you agony need 2. WoW Finding this post for the first time because of a facebook link. These all sound like great recipes to turn into gifts! I just got married two months ago and I think I will use some banana bourbon as “Thank You” gifts! Hey, what would happen if I left it for 3 weeks. I am going away, and the only way bourbon lasts three weeks is if i’m not there. Would it be too long though? Alicia – found your blog three weeks ago and was immediately hooked! Just finished my first batch of Banana Bourbon and was so excited that I started 5 other infusions at the same time! Thanks for the inspiration! how long does it last after the fruit is out? How do you think it would do as a rum infusion? I can see adding it to my fave, Pina Colada. 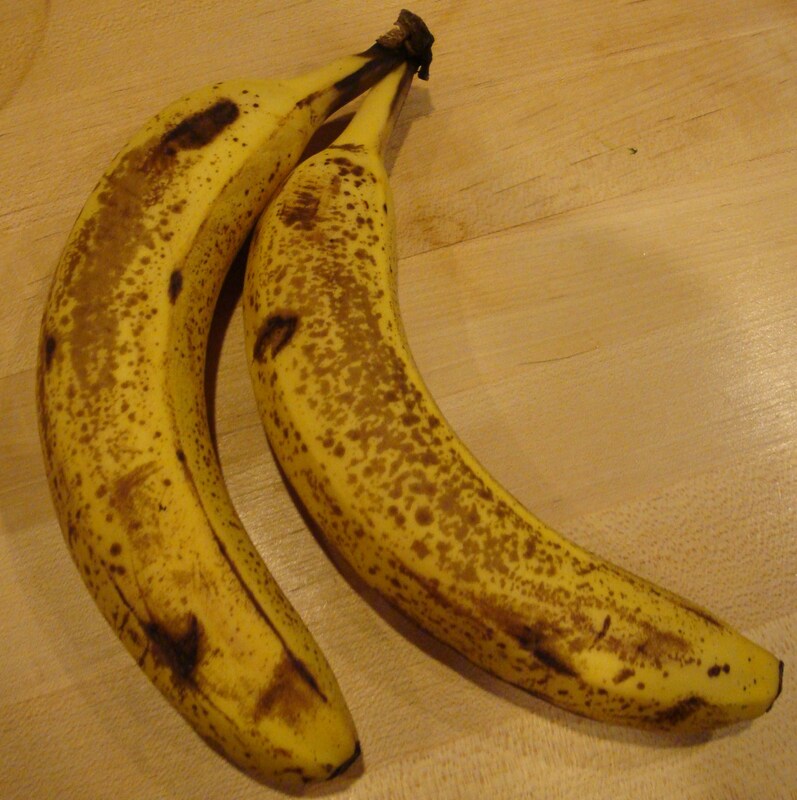 Hi Alicia… Did the banana rum ever come to frutition? I have just a quick question…when you let the banana sit in the bourbon for 2 or more weeks, is this at room temp? Or do you refrigerate? Room temperature is just fine! The alcohol level is high enough that it doesn’t need to be refrigerated. Thank you! Have 2 perfect bananas and some Bulleit Bourbon just screaming to be infused! Any good ideas for the leftover bananas? What do you mean by infuse? Just put the bananas in the bourbon?